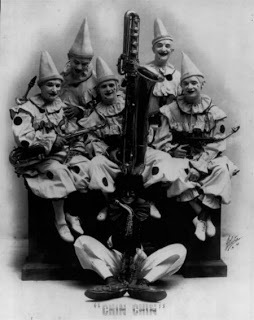 “Chin Chin” was a musical show during the 1910s and 1920s. Donna Montran (born Madonna Montran) joined the show in 1919 and traveled across the country with the show. The “Chin Chin” Crew packed up from the show Monday night in Sandusky, Ohio, traveled overnight the 100 miles to Lima, Ohio, to set up for another one night performance. 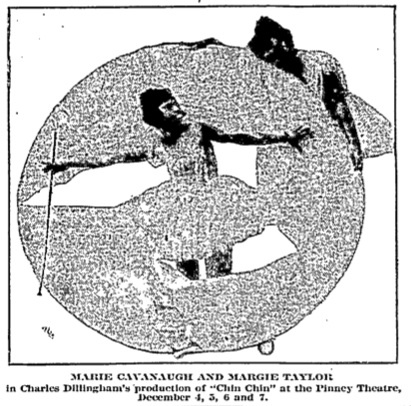 Advertising for the “Chin Chin” performance began in the Lima Daily News on 1 April 1920 with both an ad and a short article in the Theater and Movies section of the paper. FAUROT–”Chin Chin” is scheduled for appearance at the Faurot on Tuesday night with Walter Wills and Roy Binder in the leading roles, assisted by the biggest musical comedy aggregation on the road today. The Plot of “Chin Chin” is so arranged that there is ample opportunity for many vaudeville interpolations of a nature that assures one hundred and fifty minutes of entrancing hilarity. To relate the tricks of the pair of Chinese as they go thru their Arabian Night’s take would require much space. “Chin Chin” is a clean and wholesome play, in seven scenes, requiring two sixty-foot baggage cars; the company comprises 65 people, mostly girls who appear in rich oriental costumes of many designs and variegated colors. The following Sunday another an article ran in the Sunday News which included a rare photo of Donna with fellow “prima donna” Ethel Lawrence. Donna is clearly on the right. Also, that issue of the paper included a much more thorough advertisement about the show including the Clown Saxophone Band and the Funny Laughing Horse. Further advertising on the day before the show and the day of the showing was similar. The show appears to have gone on without problems. We don’t know if the company played on the 7th or 8th or if they had a couple days off, but they were in Steubenville on April 9th. Benjamin C. Faurot was a successful businessman in 1881 when he began construction on the Faurot Block. Facing Main and High streets, the building would be five stories high and include offices, stores, a music hall, the Lima National Bank, and the Faurot Opera House. The block design was in an “Americanized composition of the French Renaissance and Queen Anne.” It was a strikingly beautiful design and structure, so much so, that it is said to have so impressed New Yorkers that they used it as a model for theaters there. The opera house opened in 1882 and was used for plays, vaudeville, and movies until June 1934. Julius Cahn Theatrical Guide for 1913-1914 reported that the Faurot Opera House seated 1,183 people; 467 on the main floor, 266 in the balcony, 400 in the gallery, and 50 in boxes. It had a 30’ by 30’ stage with a five-foot apron. The auditorium was used for storage for a time in the 1940s, then the Opera House was demolished in 1953 to make way for a Kresge Drug Store. The newspaper articles I found regarding this show were from The Lima News . However, other newspapers of the time included the Republican-Gazette, Times-Democrat, the Advertiser, and the German language Courier. These papers should also be searched for potential photos and articles. Today was a Newspaper research day. I utilized three of my favorite newspaper sites looking for places that the show “Chin Chin” was playing during April and May of 1920. “Chin Chin” has funny search results depending on how and where you search. 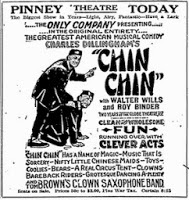 I have found that instead of searching for Donna Montran and “Chin Chin,” it is better to search for Chin “Roy Binder” or Chin “Walter Wills.” Binder and Wills were the stars of the roadshow and are named in almost every article regarding the show. Elephind is a free site. It searches the Chronicling America (US Library of Congress) as well as several other newspaper sources including the California Digital Newspaper Collection, and Illinois Digital Newspaper Collections. The advanced search doesn’t give many additional search options, just years, countries, and sources. In my case, I sought only records in the United States and during the year, 1920. Elephind makes downloading a searchable PDF very easy. First, click on the article page. Then I highlight the page information, for example, I highlighted the following: The Bennington evening banner., May 13, 1920, Page PAGE TWO, Image 2. Then click on PDF and then the download icon. When it presents the file name, I replace it with my copied title. The metadata for the downloaded file indicates where the it came from. So between the filename and the metadata I have all of my source information. Next, I went to Newspapers..com. Their search methodology is straightforward. It is easy to narrow the date to a particular month, in my case I searched from Apr 1 to May 30, 1920. Once Newspapers.Com identifies your matches, it is very easy to review the option then print/save the article as either a clipping or as a full page. The good news is that if you select “Save as PDF” it auto-documents the source information for the page. The bad news is that the article is an image within the PDF and is not searchable. It is like a JPG embedded in the PDF. Next, I searched Newspaper Archives. I had a subscription to Newspaper Archives a few year ago and liked it. Now my subscription is through MyHeritage where my Data Subscription allows access to Newspaper Archives. The good news is that searching Newspaper Archives within MyHeritage resulted in many more matches than either Elephind or Newspapers.com produced. The bad news is that the date filters, even when set to “Match Exactly” don’t work. So, my search for “Chin AND Binder AND Wills” during April 1920, yielded 787,764 results. Admittedly, the first six matches were all articles I was looking for, however, after that the matches began to be from other months within 1920. I did run into a problem using Newspaper Archives via MyHeritage. I often would find a match and then click on the article to see the detail, then not be presented with an option to display the actual page. I could not view the page nor download it. I sent their customer support an inquiry and provided them a screen shot of what I was seeing. Upon drilling in and verifying the information was what I was looking for, sometimes the files downloaded fine, sometimes the file download errored. I was, however, able to download all the files I could zoom into and review. Like the technique I used on Elephind, I’d copy the newspaper title, examine the article, confirming it was an article I am interested in; then I’d download the file using the Document information I copied moments before. The files downloaded are PDF files and are fully searchable. I used to have a subscription with Genealogy Bank. I liked them, but I found I just couldn’t afford three premium newspaper services. Once one of my other premium newspaper services expires, I won’t renew with them and will go back to Genealogy Bank. My plan is to continue with two premium newspaper subscriptions at a time. The research didn’t fill out April and May 1920, in its entirety, but adding a dozen new places for Donna Montran’s career is a good day of research. Now I just need more time to research the particular venues.